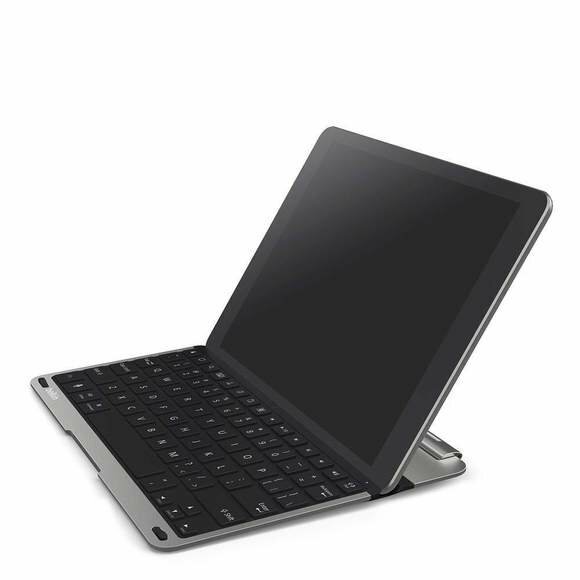 Belkin QODE Thin Type Keyboard for iPad Air ($100)—This magnetic keyboard cover’s typing area is a bit deeper than the Logitech's, due to the addition of full-size numeral keys and a row of custom keys dedicated to media playback, volume control, and the like. Strangely, the colon/semicolon key is pushed down next to the space bar—a decision may well flummox touch typists—but otherwise it is on a par with the Logitech cover, though with slightly smaller keys. None of this overly impacted my performance: I hit 73 words per minute with a 1 percent error rate, making it my overall “fastest” keyboard by a sizeable margin. Kensington Pro Plus Folio with Backlit Keyboard ($100)—The selling point here should be obvious: Backlighting means this is easier to use in the dark. 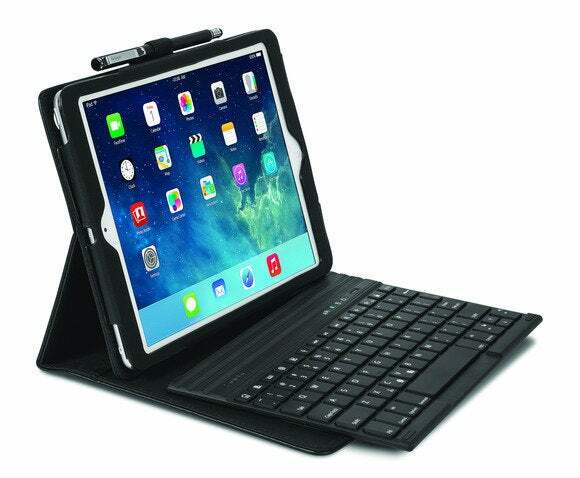 It’s also a full, padded case, so it offers more protection in case of a drop, and—a feature not to be overlooked—the actual keyboard is removable, so you have lots of flexibility when it comes to positioning screen and tablet. Like the Belkin, it has a full-size row of number keys and custom function keys up top, and I really liked the sharp, crisp action on the keys, smallish though they are. Unfortunately, I ultimately hit only 51 words per minute with a 5 percent error rate, because my keystrokes didn't always register. Considerable training to hit keys with extra force, which is tough on a keyboard this small, is essential. A number of alternative keyboards are available. Here’s a look at some of the major players. Fleksy—This is a popular alternate keyboard that incorporates basic gestures (swipe left to delete, swipe right twice to add a punctuation mark) with a simple, no-frills keyboard. With its larger keys and clean interface, Fleksy makes it easier to hit characters correctly, and its predictive-text feature seems to be uncannily accurate. However, if you need to input numerals or special characters, you’ll still have to dig into secondary menus. I was actually slower with Fleksy—22 words per minute with a 5 percent error rate—than with the stock iOS keyboard, but I expect practice would improve that quite a bit. Considering the world text messaging speed record was set with a Fleksy keyboard at a rate of over 82 words per minute, it’s an option worth considering. Swype—Why type when you can Swype? So goes this alternative keyboard’s slogan, an allusion to the way you interact with the keys: by fluidly dragging, or swiping, your finger from one character to the other instead of tapping on them individually. Swype is available for Android only, but similar keyboards can be found for iOS if you want to give them a try in a sandbox. Swiping action aside, I also preferred the Swype keyboard layout, which features more punctuation and the ability to resize the keyboard, but there’s a learning curve. Ultimately I was able to work my way up to 30 words per minute with a 3 percent error rate, but I never felt as comfortable as I did with regular typing, particularly when trying to enter longer words. Google’s own Android keyboard (downloadable if your device doesn’t have it preinstalled) now has Swype-like technology built in, as does the well-reviewed SwiftKey. 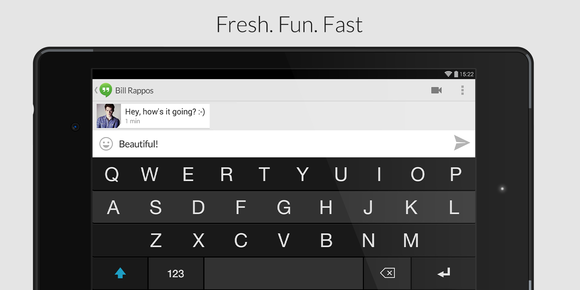 Swype-ing may be faster than typing for some.